I sprinkled some candied coconut on top. Oh. Yeah! I had to put "magic" in the name of this recipe because I am still amazed by how tofu can be made to replace "cheese" in recipes. And its super low calorie (if you care). Before I had to give up dairy, cheesecake was one of my all-time favorite desserts. So I missed cheesecake. 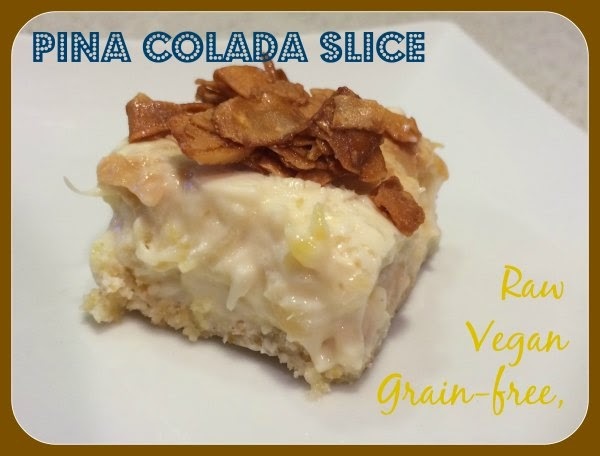 And I wanted a Pina Colada slice at Christmas-time. I had originally also given up soy. But I find that I can handle it in moderation and I stick with the organic, Non-GMO variety. For this dessert you need to buy the Silken tofu (I used firm which they were selling at Costco - not sure if its still there but you can get it at any grocery store). Anyway, I got my Pina Colada slice. Did. I. Ever. I made it three times in December. To make the base, combine all ingredients together. Mix until fully blended. Pack down into an 8 x 8 pan. I use a piece of parchment and the palm of my hand to pack it down rather than trying to do it with a spoon. For the creamy layer/topping. Blend the Silken tofu first until it is creamy and smooth. Drain the juice from the crushed pineapple into a saucepan. Heat the juice over medium heat until just boiling. Turn off heat. Sprinkle with gelatin and let sit for one minute. Use a whisk and vigorously whisk the mixture until all the gelatin has dissolved. Add tofu, coconut, honey, Truvia, and drained crushed pineapple. Thoroughly mix together. Pour the creamy topping onto the base. Refrigerate overnight or for at least 8 hours before serving to ensure it is fully set. That's the tough part.